The first performance at Perth Theatre in four years defied all expectations when two real-life firefighters appeared on stage. A smoke alarm mid-way through Aladdin on Saturday forced the evacuation of the Edwardian theatre which has just had a £16.6m refurbishment. 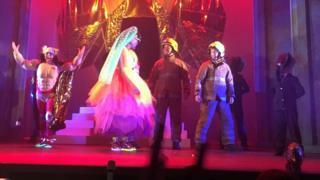 After checks to the building, the show resumed with one of the actors carried back on stage by the firefighters. The theatre management blamed a "snagging" fault for the alarm. Gwylym Gibbons, chief executive of Horsecross Arts which runs the theatre, said: "There was a lovely moment when the firefighters came on stage, carrying one of the cast members. "The beauty of pantomime is that you can adapt it to the moment - and everyone got back into the panto spirit." The theatre's 500-seat B-listed Edwardian auditorium has been closed for four years while it was restored to its former glory. Artistic director Lu Kemp said the cast became accustomed to dealing with unforeseen events during rehearsals. "But it's nothing that's ever got in the way of rehearsals: it's just added an extra layer of hilarity to the whole event."